PESHAWAR: Advisor to the Chief Minister Khyber Pakhtunkhwa Arif Yousaf has said that Pakistan Tehreek-eInsaf-led government has discussed 114 laws in the provincial assembly in which 35 laws have so far been passed by the legislators. PESHAWAR: A year has passed since the Right to Information Act (RTI) was passed by the Khyber-Pakhtunkhwa (K-P) Assembly, but it is yet to be extended to the Provincially Administered Tribal Areas (Pata) due to ‘legislative hurdles’, officials told The Express Tribune. The participants of a ceremony on the launch of a research report 'FATA, Between Constitutional Ambiguity and Violation of Human Rights' on Tuesday underscored the need for amending or abolishing Article 247 of constitution of Pakistan. The research study was launched by Centre for Governance and Public Accountability (CGPA). 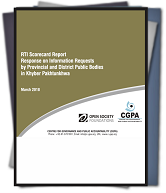 PESHAWAR: The Centre for Governance and Public Accountability (CGPA) urged citizens of Khyber-Pakhtunkhwa and Punjab to use the Right to Information law to improve transparency and accountability in public service delivery. PESHAWAR: The Khyber Pakhtunkhwa (KP) Right to Public Services Act 2013 will bring improvements in public service delivery, Right to Services Commission Chief Hanif Orakzai said on Monday.